Harry Truman sits at his desk, 1945. Library of Congress. On Nov. 4, 2014, Americans will vote in midterm elections, the second of Barack Obama’s presidency. To place these midterms into historical context, we’ve looked at Presidents Bush, Clinton, and Reagan’s second midterms. We’ve also looked at the atypical 1960s and 1970s, where no president had a normal six-year midterm election. Now let’s take a longer look back at two midterms that were more typical of the “sixth year” itch, where Americans often support the opposite party of the president in power, particularly when the economy is weak and foreign policy is unpopular. This was a sweeping election that strengthened the bare majority held by the Democrats in the U.S. Senate into a wide majority in both houses. The Democrats gained 16 seats in the Senate and 48 seats in the House. Three of these Senate pickups were for the new states of Alaska and Hawaii (which voted in 1959). Though Eisenhower’s approval was a healthy 57%, the economy was the driving force behind these midterm losses. The country was in a recession. Unemployment was a problem. Labor unions were unhappy with Eisenhower, who opposed many of the right-to-work initiatives on the ballots in several states. Likewise, the Russians had successfully launched Sputnik in 1957, igniting the race for space with America appearing far behind. This was a moderate election that reduced the majority of Democrats in the U.S. Senate. The Republicans gained five seats in the U.S. Senate and 28 seats in the U.S. House. This weakened the Democratic majority in the Senate to a two-vote margin. An economic recession and Truman’s foreign policy played a role, especially the war in Korea and the Cold War. 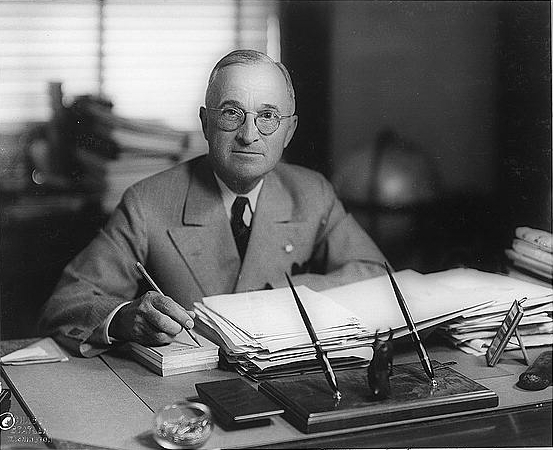 Truman had taken office in April 1945 after the death of Franklin Roosevelt, four months into Roosevelt’s fourth term. By the time of the 1950 midterms, Truman had been in office five years. His September 1950 approval rating polled by Gallup was a low 37%. This entry was posted in History, Politics and tagged #TBT, #TBThursday, Barack Obama, Dwight Eisenhower, Harry Truman, midterm elections, midterms. Bookmark the permalink.